This is a Mazda Mazda 2 Right Park lamp bulb OEM part number 0000-11-0921. It is a genuine Mazda part, shipped directly to you from our Mazda Dealership. 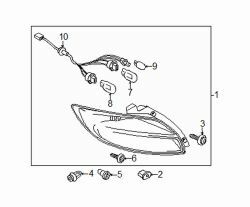 Ford part number 0000-11-0921 is illustrated as item 9 in the manufacturer's assembly drawing image on this page. Experience fast delivery, professional support, and discount pricing when you buy online from Roger Beasley Parts.